What is the difference between standard and premium series carbon rims from BTLOS? BTLOS offers Standard and Premium series rims. 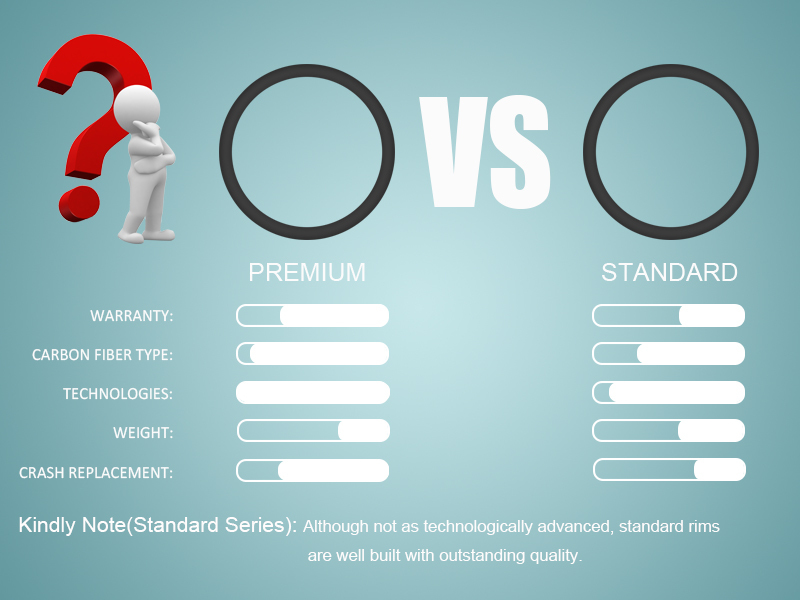 The standard version and premium version have the same production process and layup design. Standard Edition is an excellent choice for cost-sensitive buyers. For buyers who are looking for the most advanced technology and performance, you can choose the premium version. The following are the details of the differences between the standard version and premium version. The leading suppliers, representing 70% of the total market, of the type of carbon fiber used for the manufacture of bicycle parts are Toho Tenax, Toray Industrial and Mitsubishi Rayon, all based in Japan. All our carbon fibers are imported from Toray Industrial. For bikes and bike parts, T700 carbon fiber can be used singly as a material to make into products. T800 are not suitable to be used to make products separately because while it is very light, it is also very stiff and brittle. The T800 should be used with T700 carbon fiber together to improve the stiffness of products. It's not feasible to build 100% T800, as T800 is very stiff, but also too brittle for 100% composition. It is also costly! We believe the combination of 25% T800 and 75% T700 is optimal to achieve a stiff and strong rim, at a lightweight, that still has some compliance to avoid cracking and chipping and give the rider some compliance for bigger bumps. If some sellers tell you that their bike and bike parts are made fully from T800 carbon fiber, which is not feasible due to the qualities of the material. T1000 is mainly used for in the aerospace industry, and because the cost of T1000 is very high it is not generally found in the mountain bike industry. If a seller is telling you their material is T1000, please be attentive to the reality that they may not be telling you the truth. This is the main driver for the price difference between the two series of rims, so that you may benefit from some weight savings and increase in stiffness. BTLOS warrants its products to be free from defects in materials or workmanship for 3.5 years (premium series)/1.5 years (standard series) from the date of original purchase. Any product that has a problem during the warranty period will receive a free replacement product. Premium: Each rim is 10g~30g lighter than standard. The advanced version of the rims combines advanced technology and process flow. In the case of strength, each rim weighs 10g~30g lighter than the standard version. Premium: Using a molding process we call ''SLW'', BTLOS employs proprietary high-pressure bladders and specific solid silicone forms to tightly control rim shape, producing virtually void-free rims with perfectly smooth walls (inside and out) resulting in finished Rims that are truer, lighter, stronger, more durable rims and wheels. Our air bladders are made from a special material! This material is twice as expensive as normal! Premium: BTLOS employs molding and manufacturing techniques which allow us to control rim flatness to within 0.15mm and roundness to withing 0.2mm making it incredibly easy to build perfectly true, strong wheels. In addition to the warranty policy, we operate an Accident/Crash Replacement Policy. This policy applies to the original purchaser of our products for 2 years (standard series) /4 years (premium series) from the date of original purchase. In the case of accidental (causing a big jump or drop, crashing, or other misuses), we're glad to give you a price break (25% discount off) to help get you going without having to buy a new wheelset or rim at full cost. The customer pays the shipping cost. We hope this article will help you better understand the difference between the standard series and the premium series! No matter which series of rims you buy, rest assured that they all have a superb quality!